Hardest languages for English speakers to learn? Cantonese - the form of Chinese spoken in Hong Kong and Guangdong Province (150 million+ speakers) - presents a particular challenge for English speakers. There are 6 different tones in Cantonese. You must rise, maintain or lower the relative pitch of your voice to "sing" each word. For example, in English we naturally use a falling tone at the end of a statement (You came.) and a rising tone at the end of a question (You came?). To be understood in Cantonese, it is essential that you master the six tones. If you use the wrong tone, you are probably saying a completely different word. 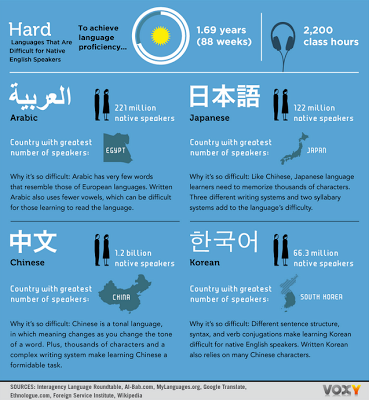 In the written form all Chinese languages (Mandarin, Cantonese etc) share one system. But the spoken forms are as distinct as Spanish and Portuguese.